We have recorded the piano part! 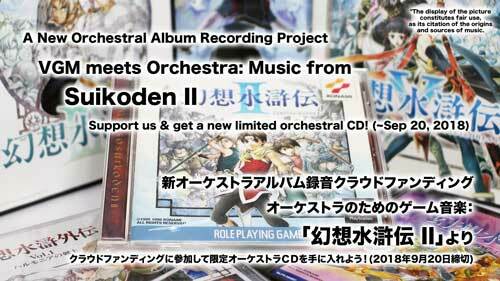 We have started new a campaigns: “Suikoden II” for your consideration. “Suikoden II” is a role-playing video game developed and published by Konami for the PlayStation system in 1998. The original music was based on orchestral and ethnic sounds that reflected the many cultures and feelings that permeated the story. We thought that the music, as well as the story, deserved a full orchestral treatment. After this fundraising is successful and we have delivered recordings to our contributors, we plan to continue to other titles from the series. Of course, a project like this intrinsically needs someone who can transform the instrumentally and artistically restricted original melodies into a full concert orchestral medium, but we did not wish to ask just any musicians to do the job. 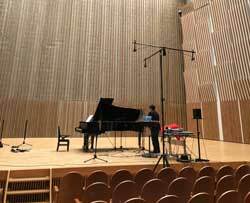 We wanted to entrust this important and challenging task to someone who had experience both in the video game industry and in concert music and with whom we could confidently work on a long-term basis. A long and careful search has led us to select the composer/conductor Kentaro Sato, and he has agreed to join VGM Classics as the music director who will oversee and direct the recording. Mr. Sato is the orchestral and choral mastermind behind such video game titles as the “DISSIDIA Final Fantasy” series, “Final Fantasy Type-0,” “Ghost Recon AW 1&2,” and some of the “Medal of Honor” titles. The prospective orchestra is the Budapest Symphony Orchestra (BPSO). 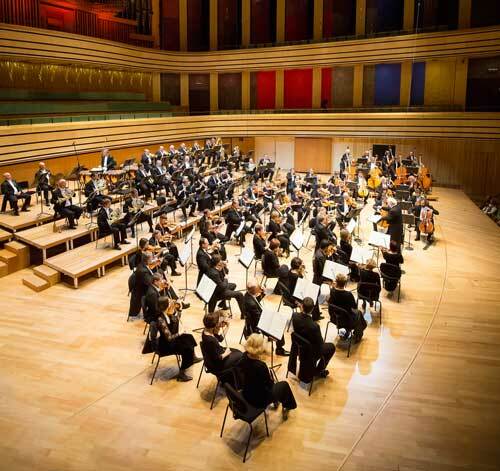 BPSO was founded in 1992 by members of the Hungarian Radio Symphony Orchestra (HRSO) for projects and activities outside their usual performance and broadcast duties. Over the years, BPSO has provided wonderful orchestral colors for many classical music, film, and television productions. For more information, please visit our website. $40,000 = an extended album (40 to 72 minutes of music) = 800 to 1150 patrons. We had considered offering a short album (10 to 18 minutes), but many of our patrons felt that a short album was too short and that a medium album would be a better and more realistic starting point for our projects. After all, there already are many video game music orchestral albums in this category, such as “Symphonic Suite from ACTRAISER” (30 minutes) and “Star Fox Assault: an Orchestra Sound” (20　minutes), and there are also numerous well-known classical orchestral suites, such as the “Nutcracker suite” (23 minutes) by Tchaikovsky. Lv. 5, Producer = $250 for a pressed CD, FLAC (HD/Hi-Res audio files and a bonus files download), a credit listing in the CD booklet, and access to a full orchestral score book. An mp3 file is at 320kbps, and a FLAC file is at 96kHz/24bit. Supporter, Founder, and Producer level patrons can buy one or two extra pressed CDs for $20 each: simply add the appropriate amount for what you want when you pledge. The Founder and Producer levels will include (if any) bonus materials, arrangements, and files that will not be included in the CD. In addition, Founder and Producer level participants’ names (actual name or desired pseudonym) will be acknowledged with a listing in the pressed CD booklet. Producer level patrons also will have access to a printed music book of a conductor’s full orchestral score in A4 (similar to US letter size). Since this is an internal document, we will ask you to sign a simple form stating that you—as one of the producers—will treat the score as such. The orchestral score and parts will NOT be sold to the general public. If this project ends successfully, we would continue to crowd-fund other game titles from the same series and/or beyond. 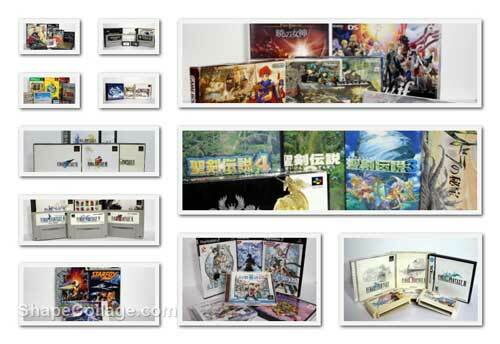 Initially, we plan to focus on classic video game titles from the 1990s and early 2000s, because one of the motives behind the founding of VGM Classics was the fact that it has been very difficult for American game music lovers to obtain Japanese video game soundtrack/arrangement CDs from those decades. However, we could consider titles on any old and new gaming platforms. Since we are not affiliated with any single video game company, the project possibilities are virtually endless. Of course, for such future projects, we will welcome your requests and suggestions. VGM Classics is for fans and concert ensemble lovers. We will do our best to make your wishes come true. We expect that our projects not only will fulfill the wishes of game music lovers, but also will contribute to the advancement of musical art and culture at large. Please support us and the video game music that you love. In a word, yes, the upcoming records will be licensed. After we have distributed all the rewards to our patrons, if there are any pressed CDs left, we might consider offering them for sale to non-patrons. Any sales plan to the general public is undecided and not guaranteed at this point. Unfortunately, we cannot offer a vinyl LP as one of the reward options for the initial crowd-funding campaign for recording, because production and distribution for a vinyl LP are considerably more expensive than those for a CD. However, after the initial recording, production, and distribution of the CD are successfully completed, we could offer an additional Kickstarter campaign specifically aimed at the production and distribution of a vinyl LP. That will largely be determined by the total amount of the pledges that we collect. However, in accordance with the determination of our music director, the minimum number of musicians involves will be sixty for a full orchestra. Because of contractual requirements, we cannot fully disclose that information. However, the CD production of 1000 copies with international shipping will cost about $6,000. The recording costs involve fees for musicians, studios, engineers, score preparation, mixing, and post-production. There are also license fees for copyright owners and other related parties. In addition, Kickstarter’s fee is about 8% of the total pledge amount. Broadly speaking, your pledge will cover about 50 to 70% of the total cost of each pledge goal.